Deep learning tech is doing some of its best work in hospitals. Deep learning tech is making itself at home in hospitals by helping radiologists examine medical scans for just a buck per image. Now, GE Healthcare is bringing that AI tech directly to the scanners, thanks to partnerships with NVIDIA and Intel. 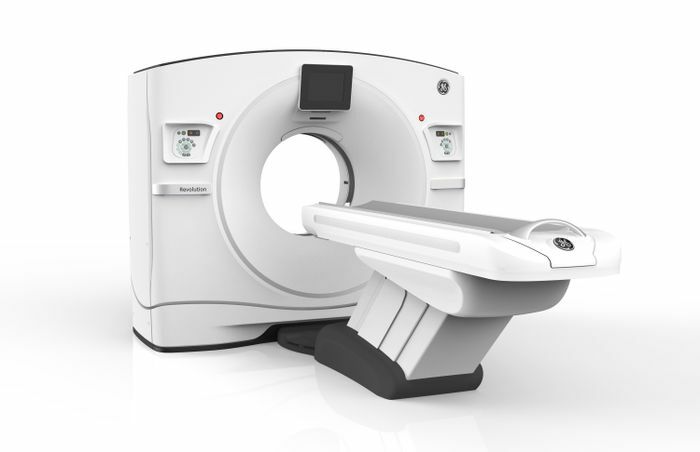 It announced that it will update 500,000 of its medical devices around the world with NVIDIA AI tech, most notably its Revolution Frontier CT scanner (below). The tech "is expected to deliver better clinical outcomes in liver lesion detection and kidney lesion characterization because of its speed," GE wrote in a press release. The tech will also be used in GE's advanced ultrasound imaging devices to provide visualization and quantification of data. "NVIDIA's GPUs accelerate reconstruction and visualization of blood flow and improve 2D and 4D imaging for ... interventional deployments," the company said. Clinical diagnosis has dramatically improved thanks to improved imaging via incredibly advanced MRI, CT and other machines, but there's a downside to that tech. It generates up to 50,000 terabytes of data, per hospital, but only three percent of that is analyzed or even tagged, says GE. Using AI would not just help patients, but also make the data available for further analysis so the algorithms can be refined even more. As such, GE is also developing a new analytics platform and placing some of the data in NVIDIA's GPU Cloud. It has also teamed with Intel on its Xeon Scalable platform to get images to radiologists more quickly. AI can produce impressive results, but it often takes months or even years of training to get there. For instance, Zebra-Med was only able to unveil its $1 per scan service after training its system on millions of images, in cooperation with hospitals in the UK and US. Companies like GE, NVIDIA and Intel have an even larger reach, and can potentially give researchers a more impressive amount of data to work with. So, for now, Elon Musk's fears aside, AI has a better chancing of healing us than hurting us.